David Rostollan, ND, holds a Bachelor of Science in Natural Health and a doctorate in Naturopathy. He is a professional health and nutrition consultant, and his primary interests include heart disease prevention, chronic illness support, and diet and lifestyle coaching. 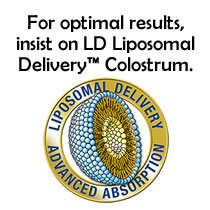 Dr. Rostollan recently shared an inspiring story of how colostrum helped in a case of neonatal lupus. Horton Tatarian, M.D., graduated from U.C.L.A. School of Medicine. He also holds a Bachelor of Arts degree in biochemistry from the University of California at Berkeley. Dr. Tatarian no longer practices medicine in the traditional sense. He is now President of Nutriphysiology, a company which supplies nutritional supplements. As a biochemist with a medical background, he is also able to recommend certain nutritional supplements to his customers. Since colostrum has been known and used as a healing and strengthening remedy for centuries, medical researchers have studied it extensively. Studies conducted around the world show that colostrum is a unique broad-spectrum natural supplement and food with efficacy in a wide range of areas.